UPDATED: Wed., April 4, 2018, 3:28 p.m.
BARCELONA, Spain – Roma made the already daunting task of beating Barcelona that much harder after scoring two own goals to help the Spanish side secure a 4-1 victory in the opening leg of their Champions League quarterfinal on Wednesday. The pair of own goals by Daniele De Rossi and Kostas Manolas plus some sloppy defending that allowed Gerard Pique and Luis Suarez to also score left Roma on the verge of elimination before next week’s return leg in Rome. “We committed individual mistakes and made it easier for them, and you can’t do that against Barcelona,” Roma coach Eusebio Di Francesco said. With Roma reeling following its two self-inflicted wounds, Pique added a third goal for the hosts. Edin Dzeko pulled one back for Roma in the 80th minute before Suarez scored Barcelona’s fourth, breaking his streak of 10 matches without a goal in the competition. 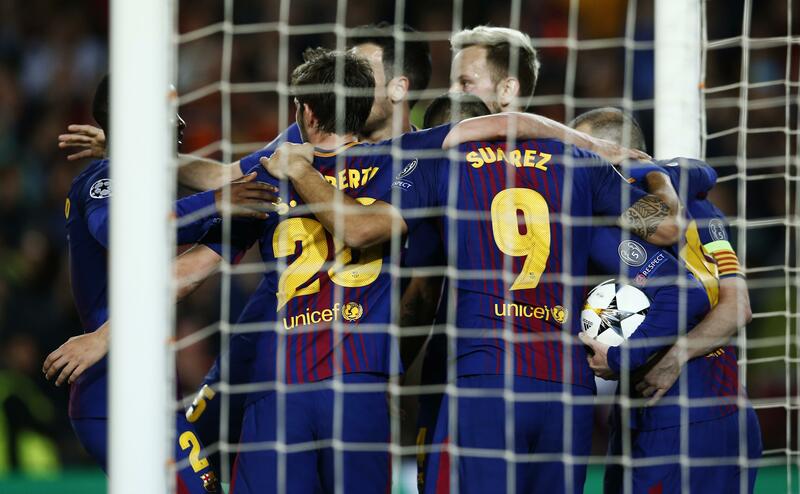 The victory extended Barcelona’s unbeaten run in the Champions League to 26 straight home matches, a streak that dates back to September 2013. Liverpool beat Manchester City 3-0 in the night’s other match after first-half goals by Mohamed Salah, Alex Oxlade-Chamberlain and Sadio Mane. Roma, playing in quarterfinals for the first time in a decade, succeeded in disrupting the hosts’ ball-possession attack by pressuring up the pitch. But its defending lapses either produced or played a direct part in all four of Barcelona goals. Lionel Messi showed no signs of being slowed down by the leg muscle problem that caused him to miss two friendlies for Argentina and be reserved as a substitute at Sevilla on Saturday, when his goal in the 89th-minute secured a 2-2 draw. Messi had already forced Roma to swarm on several occasions to stop his runs before the visiting defense finally broke when Ivan Rakitic intercepted the ball near the box and started the attack that ended De Rossi’s costly error. Messi sped into the area and passed for Andres Iniesta, whose returned pass to the Argentina forward would have left him in good striking position. De Rossi stretched to cut off the pass, only for the tip of his right boot to redirect the ball into the bottom corner of the net for the 38th-minute opener. “The goal by Daniele (De Rossi) from the edge of the area, that ball only goes in once in a 100 times. It conditioned the match,” Di Francesco said. Kostas suffered similar bad luck in the 55th when his clearance of a low cross by Rakitic hit the post and ricocheted off his knee before finally crossing the goal-line. Pique made it 3-0 four minutes later when he only had to tap in the rebound from a save by goalkeeper Alisson Becker, who palmed a shot by Suarez right to the unmarked defender. Suarez scored his first goal in the tournament since March 2017 after a Roma defender Federico Fazio tried to intercept a pass, instead leaving the ball for the Uruguay striker to drill home. Sergio Busquets returned for Barcelona after being sidelined for three weeks with a fractured bone in his right foot. Lorenzo Pellegrini started in place of Radja Nainggolan after the Roma midfielder was ruled unfit to play because of a muscle injury he picked up over the weekend. Published: April 4, 2018, 1:39 p.m. Updated: April 4, 2018, 3:28 p.m.